It's a while since I wrote an 'Inspiration Behind the Story' post but my story, 'The Love Boat', in this years People's Friend Summer Special lends itself perfectly to the series. The story is set in Switzerland - more precisely Lake Brienz near Interlaken and the romantic Grand Hotel in Giessbach -the idea came to me during a boat trip on the lake. It was a year ago in May and we had been holidaying in Wengen for my husbands fiftieth birthday (you can read more about it in my blog post Another Writing Break - oops). We'd had a whole range of weather, heavy snow on our arrival, brilliant sunshine for a couple of days and now grey skies with the threat of rain. We'd done lots of walking and thought the boat trip would be a nice way to spend a rather overcast afternoon. We had a timetable showing where the boat stopped but hadn't brought a guidebook with us so had no idea what any of the places were like. We would have to play it by ear. The lake was beautiful and despite the drizzle we went out on deck and took lots of photographs. Then, there was an announcement that we would be stopping at Giessbach. We looked over at the shore but couldn't see anything except what looked like a funicular running up the mountainside. As we got closer, we noticed, high up on the mountain, what looked like a fairytale castle. There didn't seem to be anything else there but we were so intrigued we knew we had to get off the boat and investigate. We were the only ones - everyone else apparently preferring to stay in the warm cafeteria. We loved the funicular. Built in 1879, it travels for 345 metres from the little pier at Giessbach-See to the Grand Hotel (which was the building we'd seen on the mountainside). The ride took only four minutes but we travelled through woods, over bridges and alongside waterfalls. Once we got there, we found ourselves totally alone. It was magical. Taking the little trail to the Giessbach Falls, we stopped underneath its cascade and looked down at the lake through a white haze. I could just make out the little boat making its way to the next stop. There was no one about, as the season hadn't yet started, and it felt very strange but magical. I knew I wanted to set a story there. My husband and I had shared the wonder of Giessbach together but what if things had been different? What if the woman in my story (Gina) longed for romance and a place in which to dream? 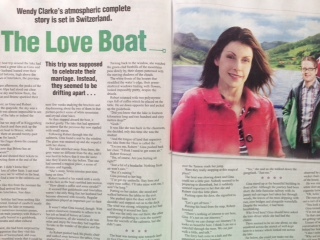 What if her husband (Robert) was more interested in timetables, guidebooks and itineraries? What if she jumped off the boat when it arrived at the little pier and left her husband on board? So many questions - I couldn't wait to get home to write the story. My story, The Love Boat, has it all: the mountains, the lake, the funicular, the fairytale hotel, the waterfall... and someone who shows Gina that dreams really do come true. When the story appeared in the Summer Special this week, I rushed out to buy it so that I could see the illustration. I was extremely happy to see that it was by David Young - the same artist who had illustrated my People's Friend first serial, Charlotte's War. He gets it right every time. Here I am at the Palm court in the Waldorf Hotel in London. My husband took me there a couple of weeks ago for a tea dance as part of my birthday present. It's not the first time we've been - we went three years ago and you can read the blog post I wrote about it called 'Waltzing at the Waldorf' here. What a wonderful time we had! We danced to the fabulous Berkeley Square Society Band and were served the most delicious tea. In contrast, last Saturday, we went to a friend's birthday party. Music was provided by a DJ and we were left to 'do our own thing' as my dad used to call it! We realised it was a while since we'd had to dance without set steps. What do we do with our feet? I wondered. Luckily, it all came back. I was that eighteen year old in the night club again (good job my daughters weren't there to see). Seriously though, It doesn't matter what style of dance it is - my husband and I just love it. And at a party, it certainly beats standing around talking. I couldn't help but compare my love of dancing with my love of writing. They are how I express myself best and to me, dancing perfectly describes the writing process. 1. Any one can do it but not everyone can do it well. 2. There are many reasons why people do it: for themselves, for others, for fun, for money. 3. The more you practise, the more the steps (both dance and writing) get easier. 4. Neither are easy all the time: we miss steps, go off beat, falter. 5. You can experiment with different styles: in dance it might be ballroom, Latin, ballet, salsa or modern jive. In writing it might be flash, short stories, articles, serials or novels. 6. Slow, slow, quick quick slow... I'm sure we all recognise that one! 7. Finding the rhythm in the music is like finding the flow in the story line. 8. You can go with the flow or learn the rules - it depends on what you're dancing/writing. 9. They are both a great form of self-expression. 10. However good you are, there is always more to learn and someone better than you. I hope I shall be doing my two favourite things for many years to come. I'm going to come clean. I've been away again. It must seem like I'm always somewhere but it's just the way it's happened this year - everything seems to have come at the same time. This time it was my annual trip away with my six girlfriends. We've been doing this for years (sometimes in England and sometimes abroad) and this time we decided to visit Florence. Even though I have been twice before, I never tire of it as it's such a fabulous place. We went from Friday to Monday and, as some of the group hadn't been before, made sure that we 'did' all the major sights. As you can see, we went to the Academia gallery to see Michelangelo's David (we were all in agreement it was the only thing worth seeing there) and I'm glad we did, as it gave us the chance to see his enormous hand. I am not joking, his right hand is like a giant's... has anyone else noticed this? I've just googled it and found out that it's probably because the statue was originally meant for the roof of the cathedral (though why this means he had to have a big hand, I'm not sure). The Uffizi gallery wasn't top of my list of things to see in Florence (not being much of an art buff) but I have to say I changed my mind once I was in there - it was seriously impressive. Who wouldn't be awestruck by paintings such as the ones below? Those who follow my blog might remember that I hate heights, so on the second afternoon, I gave the climb up the dome of the Duomo, and the even dizzier heights of the campanile, a miss to go wandering by myself. I have to admit that I usually leave the map reading and organising to others in my group (you can't have two many chiefs) so it was nice to be able to plan my time and prove to myself that I'm perfectly capable of walking around a city and not get hopelessly lost. I'm glad I did, as I discovered the Michelangelo Piazza, with its stunning views over the city (see above) and the lovely monastery behind it. When I got home, I told my husband all about it. But you've been there before, he said. When I told him I hadn't, he produced, as evidence, the photograph he'd taken when we visited five years ago. Spot the similarities? This is the photo I took this year. I try not to feel guilty about all my trips. I really do value each and every one of them and no experience is ever wasted. In fact, I've written (and had published) a story from every place I've visited in the last four years As my old English teacher used to say... it's all grist to the mill. Now, before I go - a little writing news. 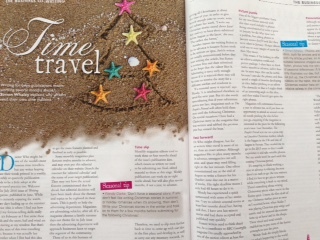 I was interviewed by Simon Whaley for his article in this month's Writing Magazine on 'Time Travel'. Before you wonder... it's not about my next trip into space but about the need to write seasonal stories several months ahead. I also have a story in this week's People's Friend called Five Minutes More. And that's it from me for now. No more trips away, I promise... until the next one!